This issue, no 68 has the usual selection of standard features plus an extended feature on British “lost” airfields, extending from the feature on the lost airfields of Middlesex from as far back as Issue 30, Mar 2000. Also featured is the return of Phil Munson with a piece on Airship R34 and a follow up to the last issue on post partition India, this time dealing with Pakistan. 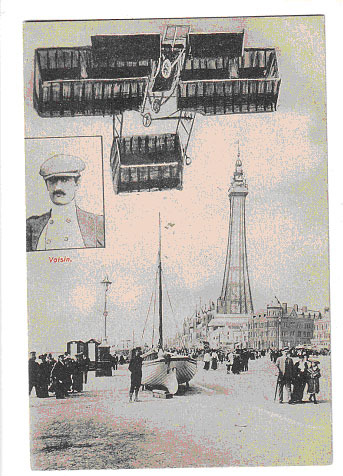 The lead picture illustrates the Pioneer pages with a hastily produced card, overlaying a portrait of Voisin and his machine over a Blackpool Tower view for the Aviation meeting of October 1909.